Carlos Chan Ka Lok yesterday attended an event and revealed that he has been busy with the Emperor Motion Picture GUNG GUP GAU WOON (EMERGENCY RESCUE) in Xiamen. He said that when he met director Dante Lam Chiu Yin in August, he told him to learn to swim. Thus in a few short months he already learned the breast stroke and free style. Yet when he joined the team, the director kept his character from getting into the water! Ka Lok admitted that he has already in tip top shape because at each shoot he was in full gear. However he was in uniform for the entire film and did not need to show his muscles. Even Eddie Peng Yu-Yan would not have the chance to flash any flesh. He also revealed that the team will shoot an underwater scene in Mexico later, at the studio where TITANIC was shot. 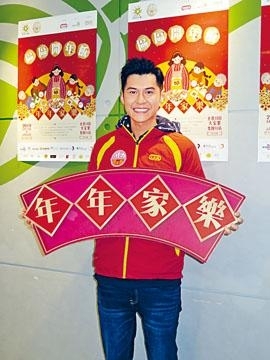 Ka Lok reiterated that he and Jeannie Chan Ying did not avoid each other during a photo opportunity at a charity event. "I just want to leave some freshness for the audience, wee will shoot a promotional video together today. (Would you publicize your romance during the promotion?) No romance! We are just friends."